In July, “06880” broke the sad news that Sally White would close her beloved Sally’s Place record store. Current and former residents, music lovers far and wide, and everyone who cared about this warm, wonderful mom-shop owner, reacted with sorrow. They also posted heartfelt remembrances, and heaped praise, on this blog. That last day is now set. Sally will shut her always-welcoming door this Sunday, September 29. Her many fans have only a few days left. Go in. Say thanks, and goodbye. Buy one last vinyl or CD. Sally White deserves it all. 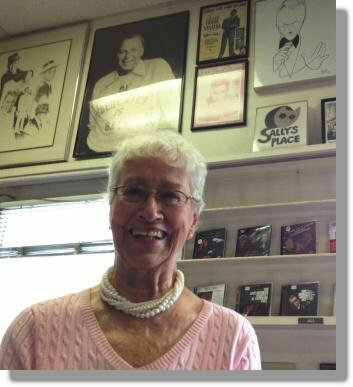 Sally White, standing underneath a photo of one of her all-time favorites: Frank Sinatra. This entry was posted in Arts, Local business, People and tagged Sally White, Sally's Place. Bookmark the permalink. Sally is the greatest. I remember visiting her weekly, sometimes more frequently at Kleins. I had diverse (some would say bizarre) tastes in music. Frank Zappa, Captain Beefheart, Claude Bolling, Larry Coryell, James Cotton, Anton Webern, Edgard Varese, Thelonius Monk, and so many more. Sally would always have the newest album or eight track there for me, and would even say I think you will like this. She was always right. I was very happy when Sally opened her own place. Though I no longer lived in Westport, I made it a point to stop in when in the area. After moving to Tampa in 2003, I had not returned. I understand the reality of the online music stores, and downloading MP3s, but it is a shame to see Sally closing. What a terrific person, and her knowledge of music could not be matched. I’m sorry that I can’t visit her store one last time. Sally, you will be missed, and loved by all. I stopped in several days ago and bought a CD. Sally still has a bunch of good stuff on hand. And I’m happy to report that she was in good spirits as the days wind down on her store. We shared some good memories, and I know Sally would welcome seeing old-time customers before the doors close for good. And, if you’ve never been there–what are you waiting for? Can anyone let me know what time the store will be open until on Sunday? I arrive in Westport from Northern Ireland on Sunday, probably late afternoon, and would love to pay Sally’s Place one last visit! I once spent $100 on CDs on a trip and thought she was going to kiss me! Lovely woman, sad to see the place go. People should value music more. She says she’s staying open at least one week beyond this Sun. Posted Sun. hrs = noon-5:00. Dan, I stopped by on Saturday, September 28th. to say goodbye and still managed to spend $65 dollars on jazz CDs… bunch of Miles Davis things and a great Dianna Krall that made the rest of my day in the van. Sally was great. I tried to coax out her mailing address but she was tight lipped and refused to say goodbye. So I told I would again in some smoky jazz club somewhere and we left it at that. Shopping at Sally’s Place will be missed by me and so many. Hello Dan,thanks for posting all these great comments..Having grown up in a musical family in Weston-Westport in the 1960’s,during Main Street’s -Klein’s Records ‘heyday’,..(& remembering always Sally’s enthusiasm,her strong sense of what recording a customer would ‘enjoy!’).. Sally saw me through (many) chapters of my music life back then..